AC Cobra 427 s/c 1;18 model, by Kyosho. Limited Edition No.7006. 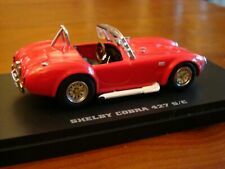 KYOSHO 1/43 MUSEUM COLLECTION SHELBY COBRA 427 S/C RACING SCREEN #6 MEGA RARE! This page was last updated: 22-Apr 05:26. Number of bids and bid amounts may be slightly out of date. See each listing for international shipping options and costs.